This is an attempt to list the published works of the family of "Flash" George Arthur Dyson & E Jane Dyson nee Mayall (the daughter of Ambrose Mayall). Their sons included: Edward George Dyson (1865 - 1931), Ambrose Arthur Dyson (1876-1913) & William Henry Dyson (3rd September 1880-1938). Edward Ambrose Dyson (15 December 1908 - 26 November 1952) was the son of Ambrose Arthur Dyson. A Golden Shanty Australian Stories & Sketches in Prose and Verse by Bulletin Writers. This anthology consists of short stories and verse selected by J Archibald & F J Broomfield and includes contributions from Thomas Bracken, Victor Daley, Arthur Desmond, Edward Dyson, James Edmond, John Farrell, Henry Kendall, Henry Lawson, E. Lowe, Francis Myers, Banjo Patterson and Titus Salt. Published in 1890, Sydney, NSW by the Bulletin Newspaper Company (172pp & 2 pages of advertisements). See also A Golden Shanty and The Golden Shanty: Short Stories by Edward Dyson below. Below and on top by Edward Dyson. Illustrated by Phil May Published by George Robertson, Melbourne 1898. Fact'ry 'ands by Edward Dyson with illustrations by Will Dyson. Published by G. Robertson, Melbourne 1906. A Golden Shanty by Edward Dyson. Illustrated by Phil May. Published by G. Robertson, Melbourne 1911. There are differences between this book and The Golden Shanty: Short Stories by Edward Dyson, see below. The stories in this book are "The Golden Shanty", "A Sabbath Morn at Waddy", "The Fossickers", "At the Yards", "Mr and Mrs Sin Fat", "A Visit to Scrubby Gully", "Hebe of Grasstree", "After the Accident", The Washerwoman of Jacker's Flat", "Spicer's Courtship" and "A Zealot in Labour". Loves of Lancelot by Edward Dyson illustrated by L. Lindsay. Publisher Bookstall Co., 1914. The Escapades of Ann by Edward Dyson with illustrated by Jim Hannan. Published by Bookstall Company, Melbourne 1919. Spat's Fact'ry (more fact'ry 'ands) by Edward Dyson with illustrations by Will Dyson Publisher N.S.W. Bookstall, 1918, Sydney. "Hello, Soldier! ": Khaki verse by Edward Dyson with illustrations by Will Dyson, Ruby Lind and George Dancey. Published by Alex. M'Kinley & Co Melbourne 1919. The Grey Goose Comedy Company by Edward Dyson illustrations by Percy Lindsay. N.S.W. Bookstall, 1922 Sydney. Billy Bluegum, or, Back to the Bush, a children's book by Edward Dyson, illustrations by Norman Lindsay. Published by Shepherd Press, Sydney 1947. Originally published in Sydney in 1912 as a serial (in the 1st April 1st May, 1st June, 1st July, 1st August & 1st September issues) in "The Lone Hand" (The National Australian Monthly). Introductory statement: "Billy Bluegum, an energetic bear who has been brought to the city, is inspired with a mission to go forth and confer the inestimable blessings of Civilization upon the bears of the Bush, taking with him a magical bag labelled "Public Loans," which enables him to scatter blessings freely." The Golden Shanty: Short Stories by Edward Dyson. Selected and with an introduction by Norman Lindsay. Published by Angus and Robertson, Sydney 1963. There are differences between this book and A Golden Shanty, see above. The stories in this book are: "A Golden Shanty", "A Visit to Scrubby Gully", "An Incident of the Old Pioneer", "At the Yards", "A Sabbath Morn at Waddy", "The Trucker's Dream", "Hebe of Grasstree", "The Conquering Bush", "A Zealot in Labour", "The Elopement of Mrs Peters", "Deadman's Lobe", "A Vain Sacrifice", "Spicer's Courtship", "After the Accident", "Benno's Little Boshter", "A Hot Day at Spats'", "The Wooing of Minnie", "The Packer's "Little Silly"", "A Saturday at Spats'", "The Fickle Dolly Hopgood", "At a Boxing Bout", "Susie Ganon's Young Man", "The Rivals", "The Man-Eater", "A Question of Propriety", "The Haunted Corner", "A Little Love Affair", "The Morbid Boy" and "The Toucher". Care needs to be taken not to confuse Ambrose Arthur Dyson with his son Edward Ambrose Dyson, as both went under the name of Ambrose. Ambrose Arthur Dyson had cartoons published in the Champion (a socialist paper), the Bulletin and probably the Critic (South Australian). The Journalistic Javelin: An Illustrated History of the Bulletin 1880-1980 by Patricia Rolfe. Wildcat Press 1979. Sydney, NSW. Contains several reprints of cartoons by Ambrose Arthur Dyson (see pages 87, 116, 148, 158 , 159 , 239). Page 267 has two by his brother Will. In 1910 he married one of Normal Lindsay's sisters, Ruby Lindsay (who published under the name of Ruby Lind) and who died on 12 March 1919. Cartoons drawn by Will Dyson. [A selection of his newspaper cartoons] Publisher The Daily Herald, London. 1914. Kultur Cartoons by Will Dyson; foreword by H.G. Wells. Published by Stanley Paul, London 1915. 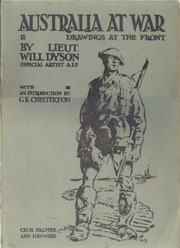 Australians at War: A Winter Record made by Will Dyson on the Somme and at Ypres During the campaigns of 1916 and 1917 [Title page]; Australia at war: Drawings at the front [Cover Title]. With an Introduction by G.K. Chesterton. Published by Cecil Palmer & Hayward, London 1918. Poems in Memory of a Wife by W.D. ie Will Dyson (Published by Cecil Palmer, dated 1919, after Ruby Lindsay's death), written to accompany The Drawings of Ruby Lind (Mrs. Will Dyson) 1887-1919, published by Cecil Palmer London 1920. Artist among the Bankers by Will Dyson; with an etching and eighteen drawings. Published by J.M. Dent London, 1933. Will Dyson: Cartoons, Caricatures and Prints 1880-1938 A catalogue published by the Australian Gallery Directors Council, 1980 to accompany an Australian tour of his works in 1980/81. Partner Phyl Ross (daughter of Jack Alexander Ross); daughter Jane (Janie). During part of WW2 worked on the official army magazine SALT (supposedly an acronym for Sea, Air, Land and Transport) as a cartoonist. Power Without Glory by Frank J. Hardy, "Ross Franklyn" with 14 illustrations by Ambrose Dyson. Published 1950. Man from Clinkapella, and other prize-winning stories by Frank J. Hardy with a foreword by Alan Marshall and illustrated by Ambrose Dyson. Published 1952? Ambrose Dyson Compiled by the Ambrose Dyson Memorial Committee, 1953. Includes a forward by Frank Hardy and a poem in memoriam to Ambrose Dyson by David Martin.